Before genes can be passed from parent cells to their progeny, a copy of the genome has to be made in a process called replication. For circular chromosomes, like those in bacteria and archaea, replication begins at the origin of replication and proceeds in two directions away from that point, simultaneously. Supercoiled double-stranded DNA is relaxed by an enzyme called topoisomerase (or gyrase) and then unwound by an enzyme called helicase, which opens up the two strands in one area at a time. Nucleotides matching the bases exposed by the unwinding base pair with their match. The enzyme DNA polymerase then joins these bases together by catalyzing the formation of a bond between the phosphate of one nucleotide and the sugar (deoxyribose) of an adjacent nucleotide. This enzyme has a proofreading function, correcting any mistakenly added nucleotides. The enzymes move farther along, unwinding the next section of DNA so that more nucleotides can join the growing chain of the new DNA strand. The site where all this is happening is called the replication fork. 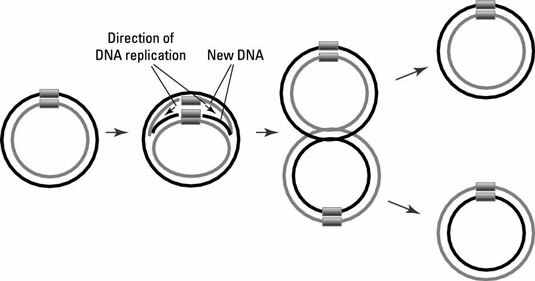 Because each strand of a double-stranded DNA molecule gets incorporated into one of the two final copies of new DNA molecules, the process is called semi-conservative replication. 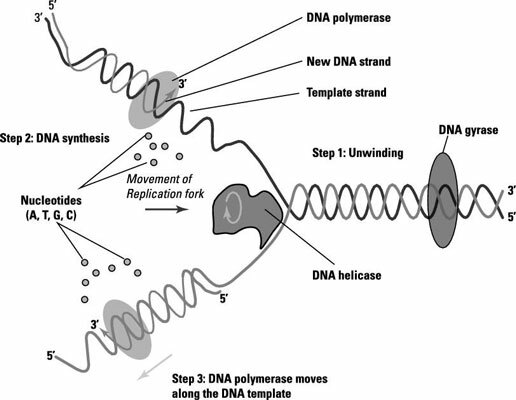 DNA polymerase can only add bases in the 5′ to 3′ direction, so replication proceeds differently on the two strands of DNA in the replication fork. One strand is called the leading strand. Bases are added smoothly in the 5′ to 3′ direction. The other strand is called the lagging strand. There, short pieces of DNA (called Okazaki fragments) are made by DNA polymerase with the help of a short RNA primer and then joined together by another enzyme called DNA ligase. The 5′ and 3′ ends of DNA (pronounced five prime and three prime) are the two ends of single strand of DNA. Because double-stranded DNA is made up of two such strands in opposite directions, one strand goes in the 5′ to 3′ direction and the other goes in the 3′ to 5′ direction. They’re named this way for the carbon atoms in the pentose sugars in their backbones. After DNA replication is complete the cell has generated two circular chromosomes from one. Each of these then becomes part of a new cell during cell division. The nucleus in eukaryotes makes things more complicated. Replication of a linear chromosome happens a bit differently than it does for a circular chromosome because DNA polymerase can start replication from each end of the DNA instead of from a point of origin in the middle. The steps are the same as for bacteria with a few extra proteins involved. One protein in particular, telomerase, makes sure that the ends of the chromosome don’t get shorter every time it’s copied. Telomerase extends the ends of the chromosome by adding repeated sequences; these repeated sequences are called telomeres. After replication but before cell division, the chromosomes become very condensed into a form called heterochromatin, which can be seen with a microscope. Next, the nucleus disassembles so that copies of the chromosomes can be separated in two directions. Another important feature of eukaryotic chromosomes are the centromeres, areas of the chromosome where spindle fibers attach during cell division. Neither telomeres nor centromeres contain genes; they’re structural parts of the chromosome only. 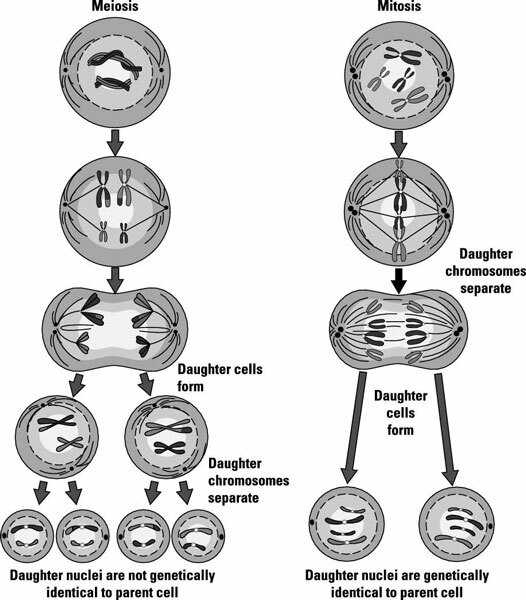 After cell division has occurred, two nuclei form around the chromosomes in each daughter cell. Eukaryotic organisms can have one or two copies of their chromosomes within the cell. When carrying two copies, the organism is said to be diploid; when carrying one copy, the organism is said to be haploid. When eukaryotic cells replicate their DNA prior to cell division it’s called mitosis. Both haploid and diploid organisms undergo mitosis and cell division, during which they make sure to have the same number of chromosomes in each resulting cell that they started with. Another type of replication, called meiosis, is used to go from a diploid stage to a haploid stage. Meiosis first involves separation of the two copies of chromosomes from the diploid cell, making two haploid cells during cell division. Next, DNA replication and cell division happen again on these two haploid cells to give four final haploid cells. In complex eukaryotic organisms, these are the cells used for reproduction (egg and sperm), but in eukaryotic microorganisms these are the spores. The following figure illustrates both meiosis and mitosis.